Chris Herbert, an alderman in Manchester, New Hampshire, is facing heavy criticism after saying elderly people should have to move if they can no longer afford their homes. A city leader in Manchester, New Hampshire, has sparked a nationwide controversy on social media after saying that if elderly people can't afford their homes, they should have to move out instead of getting a tax break. Alderman and Chris Herbert made that comment at a meeting last week. Since then, Mayor Ted Gatsas says his office has been inundated with calls from worried residents. "It's wrong," said Manchester resident Jon Watkins. "Why kick people out of their homes they worked all their lives to get it?" Rosemarie Andersen is 83 years old and lived in Manchester for almost three decades. "If you pay taxes for 27 years like I did, and all of a sudden you can't pay it, I think you deserve a break," she said. 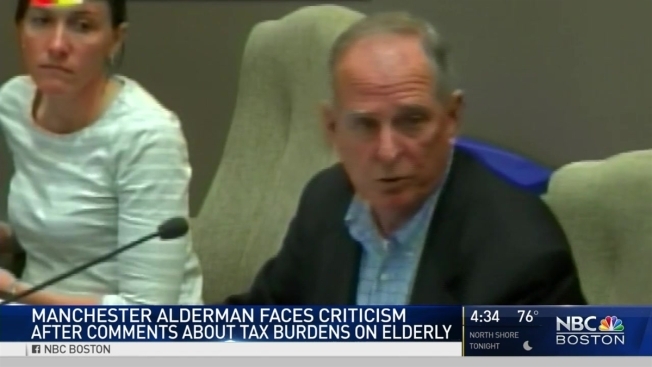 In addressing the city's budget problems at a May 24 meeting, Herbert expressed his discontent with elderly tax breaks, using a hypothetical 85-year-old neighbor who can't afford her $350,000 home anymore. "And you're saying 'Give her a tax credit.' No. We should have programs that gets her out of the house. I mean, we need to get new people to come in and occupy those houses," he said. In a Facebook post, Herbert apologized for his statement, saying, "I obviously did not express myself well." But he's stood by his position in the days since. According to the Manchester Tax Assessor, nearly 800 seniors took advantage of tax breaks last year, costing the city about $2.5 million in lost revenue. In the last few days, Herbert has said he was just addressing an issue no one else wants to talk about – the city's aging population. "We can't be run by the elderly in a city," Herbert said in that same meeting. "That's foolishness." Gatsas is one of a handful of other city leaders shocked to hear Herbert's comments, saying they have no place in this city. "It was disturbing," Gatsas said Thursday. "We need to take care of the elderly, they are the backbone and product of this community." NBC Boston reached out to Herbert via phone and email several times, and even stopped by his house, but had not heard back from him as of Thursday evening.